April is Autism Awareness Month, and April 2, 2019, was the twelfth annual World Autism Awareness Day. 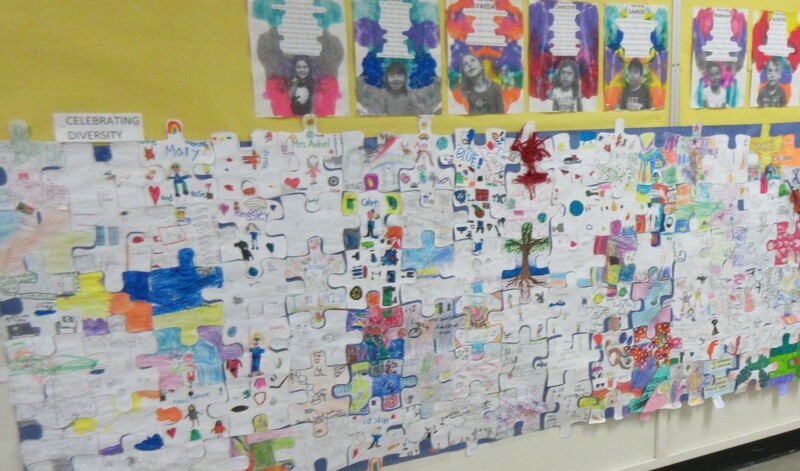 In Rossland, students at Rossland Summit School (RSS) engaged in activities to learn about autism. Teachers Wendy Phillips, Jenn McKay-Hadley and Kim Deane spoke about autism to the school while individual teachers showed videos and answered questions in their classrooms throughout the day. Many students identified on puzzle pieces some of the qualities that make them different or unique; then Jenn McKay-Hadley along with some of her students assembled the final product, illustrated above. Autism, or Autism Spectrum Disorder (ASD), refers to a broad range of conditions characterized by challenges with social skills, speech and nonverbal communication, and sometimes with repetitive behaviours. The clinical signs, symptoms and needs of children with autism -- an estimated 1 in every 66 children here in Canada -- are extremely diverse. This is why the term "spectrum" has become part of the condition's name. A child can have severe signs of classic autism, such as flapping and spinning, and stand out to anyone and everyone as having autism. Or the child can show no outwardly unusual behaviors to the common eye. He can be bright, verbal and well-behaved. Or the child could be any combination and permutation in between. Autism falls across every racial, ethnic and socio-economic group. What all children with ASD have in common is that they all have social problems that impact on their day-to-day functioning, ranging from a complete lack of social interest, to limited social motivation, to lack of the social "know-how" that other children are born with. Those who still harbour doubts should be aware that there is no connection at all between vaccines and autism. Research shows that often early intervention and treatment leads to better learning and communication skills, fewer behavioral issues, more adaptive skills of independence and less familial stress. Well known people on the autism spectrum today include professor and author Temple Grandin, author Dawn Prince-Hughes, actors Dan Ackroyd and Daryl Hannah, surfer Clay Marzo, Pokemon creator Satoshi Tajiri and musician Adam Young, to name a few. Many people suspect that Albert Einstein, Mozart, Michelangelo and Emily Dickinson may have been on the spectrum. For more information about autism, check out this link, or the Autism Canada website, or this Mayo Clinic link. For an article written by Dawn Prince-Hughes, PhD (author of the memoir “Songs of the Gorilla Nation”) on her experience, go to this 2004 New York Times item.